Wellington has been getting some blow over from a hurricane, or something like that, and has been incredibly windy during my time there. Flags make cracking noises, sign posts creak and make unhappy sounds and the noise of wind beating against the buildings can be heard inside. 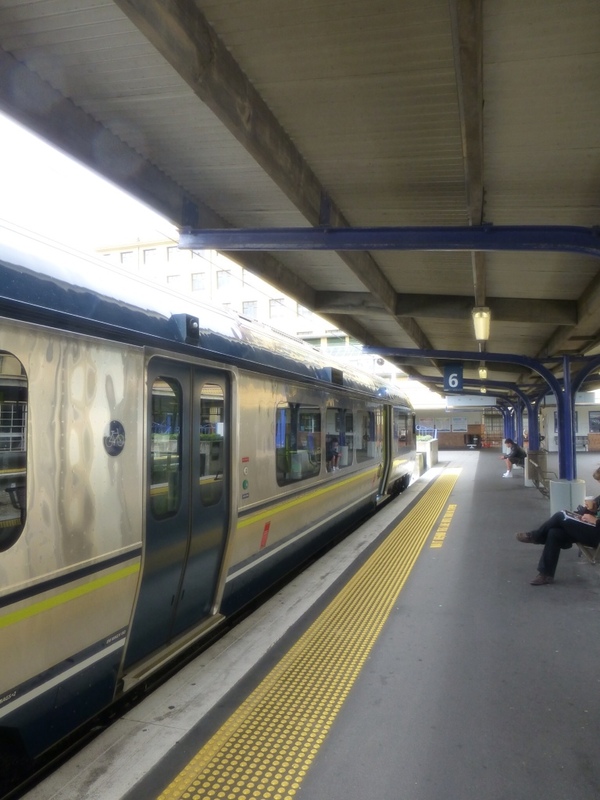 So to play it safe I caught a train this morning to Upper Hutt, the northern suburb, to avoid riding in heavy city traffic in crazy winds. Seemed to work except when I got there it was pouring. Found a library to check the weather and seemed it should let up soon so I hung out. A couple hours later I started to think the weather report was full of crap. I rain-suit up and hit the road. 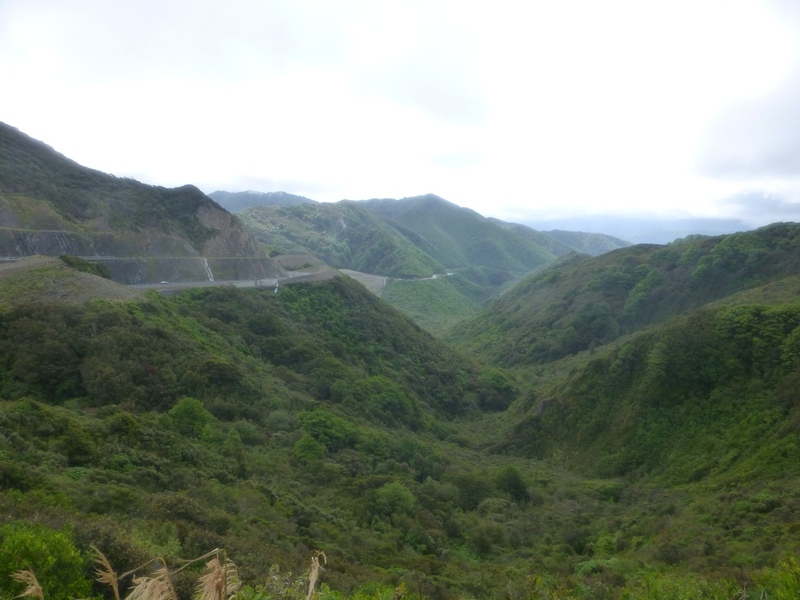 Not long into my ride I have the crazy Rimutaka hill that I start to work my way up. The higher I go, the heavier the wind gets. Now, I've gotten rather accustomed to the wind, but this was just bananas. The road twists and winds as it carves its way up 600 meters and every bend the wind changes and seems to be entirely random. This makes it hard to deal with and getting surprised by a cross wind as you make a turn with a canyon to your left side is a bit unnerving. About .5km from the peak I get hit by a gust out of nowhere and am shoved off the road into the ditch. I stay standing but am thoroughly shaken up and decide it's time to walk it. Wind keeps getting heavier and even walking is occasionally a challenge. Cars seem unhappy when I stop in the road to fight to stay upright. I get over the top and it's not any better, looks like I just killed my legs to get to walk down a hill. The first 150m of elevation loss seems to be dropping the wind as well so I get back on my bike. Stupid. I'm riding my brakes and keeping speed in control in case any wind hits but out of nowhere I get slammed with a monster tail wind as I'm approaching a sharp turn. I mash my brakes trying to slow down enough to make the turn and completely fail. As soon as I let go of the brakes to start cornering I'm shot back up to speed and, uh, make tactical use of the guard rail. I wind up sliding into it and clinging to it for a bit as I can't manage to get off my bike in the wind. Well now that my heart is pounding and my life flashed before my eyes I get back to walking, but it's not long before even that is a stupid idea. I lay my bike on the ground in the shoulder and cling to a sign pole as I try to hitch hike. Lots of concerned faces as the wind bursts threaten to blow me away but nobody in anything big enough to hold a bike stops. Many people stop to ask if I'm alright or if I need mechanical help, which was pretty cool. But I felt like a loser when I said no I'm fine, the bike is fine, I just can't ride down this hill. I was in a really bad spot because cars going the right direction didn't have enough visibility of me to stop in time. Most of the questions about my well being were cars coming the other way. I don't ask myself why I'm doing this anymore, I think I got that one figured out by now, but I'd be lying if I said I didn't think about calling it quits and going home. Bicycle touring is great, I think far more people should consider it, even if they aren't cyclists at all but sometimes I think you need to lack a little bit of sanity to get on okay for extended trips. I could have turned around when the wind started getting bad on the other side of the hill. Should have started trying to hitch hike long before I did, when I was at a much better place to be seen and hadn't had a fun run in with the guard rail. About an hour into my sitting there on the shoulder, with a handful of people stopping that I thought were going to pick me up, someone finally offers a lift down. A nice farmer tells me he will take me to Featherton, just past the bottom of the hill, before he turns off the highway. I throw my bike and gear in the back of his truck and off we go. My first attempt (and success) at hitchhiking. I later checked the Pedallers' Paradise description of this hill and it says to be cautious as “winds can be strong up there!” Yup. We get to town and the bulk of the wind is gone. All that remains is a moderate tailwind! I decide to head to the next town because well I finally have favorable wind and clear skies so I'm gonna do some enjoyable cycling today, dammit. I pedal easily for the 15km to Greytown and pitch my tent at the domain. What a crazy day. This entry was posted in Uncategorized on December 30, 2012 by twymer12.